Engineering @ Business: NEW BATTERY TECHNOLOGY - Power Technology, Inc.
NEW BATTERY TECHNOLOGY - Power Technology, Inc. Smaller Sizes, Less Weight, Increased Energy Density, Less Lead, More Environment Friendly, Faster Recharge Capabilities and Longer Life. Power Technology batteries have a unique internal structure and electrochemistry. 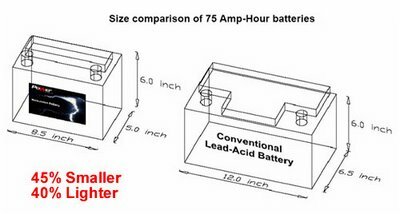 These features give the Power Battery significant advantages compared to conventional batteries, such as the common lead-acid automobile battery. It is our mission to create environmentally friendly, inexpensive power sources for use by industry and individuals, including the creation of the ultimate battery, characterized by higher energy capacity, lighter weight, and minimal lead content - for a range of automotive, aerospace, power storage and other industrial and personal applications. I think it is something that we have been looking for. This will helps a lot on the success of Electric Vehicle (EV). If the price is the same or a bit lower than conventional battery, for such that it will become a highly demanded product soon.